application on rotary tubes, rotary kilns, etc.. 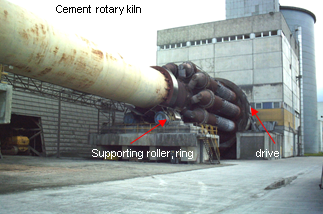 In rotary tubes or rotary kilns materials are heated and/or mixed, burned or sintered by rotation. Those installations are driven by sprockets or chain drives. 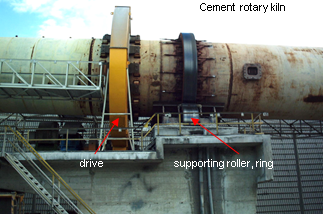 The load of the drum is carried by the supporting rollers. 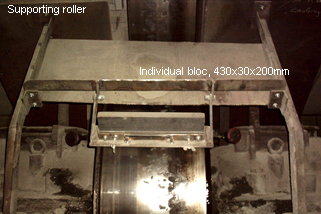 The axial rollers serve to stabilize and move the rotary tubes. Axial rollers (thrust rollers) are hydraulically or mechanically pressed to the ring flanks. Cement-, lime-, gypsum plants, plaster and mortar industry, chemical factories, paper mills, steel plants, sugar factories, quarries, raw material industry, etc. Manual lubrication on supporting rollers and rings with oils and fat. Dust, rain and pollution negatively affect the durability of this type of lubrication. Pollution of the surroundings by dripping oil and fat. 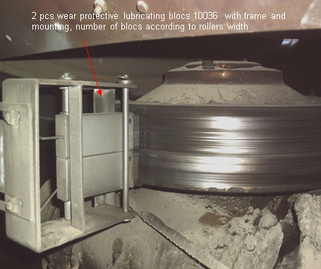 According to the width of the rollers, dry lubricating blocks "HG045" are mounted on the supporting rollers. To ensure a constant lubrication, also on uneven rollers, 2-8 blocks in individual mountings, up to the required width of 200-500mm, are applied. 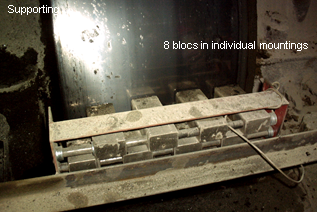 Individual blocks "HG045" in different, partly standardized dimensions are as well standard solutions, i.e. 350x30x200mm, or 430x30x50mm are installed. Due to dry lubricants maintenance-low, ecological, dry and water-resistant lubrication is realized that lasts up to 2 years!!! 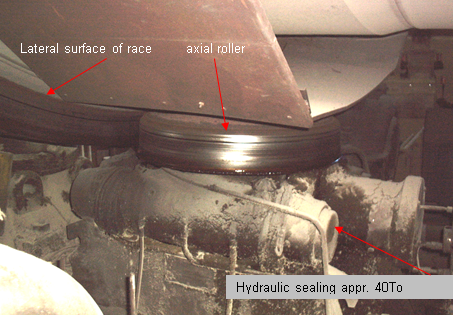 Axial rollers and lateral faces of supporting rings are extremely charged by high pressures – danger of deformation. Application of lubricating blocks "10036" with frames and mountings on the axial rollers to prevent wear and deformation on axial rollers and the ring. At the same time, maintenance is reduced. Due to the application of molybdenum disulfide, an extremely resilient and dry lubrication coating, friction and maintenance is reduced. 1x frame with quick-change system "Trkt - 2"